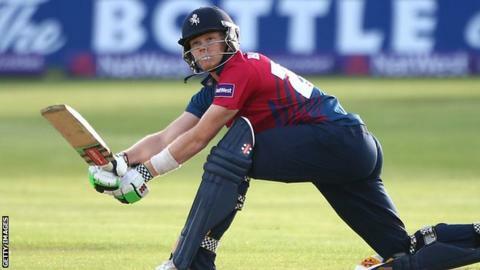 Kent wicketkeeper Sam Billings will replace Somerset's Craig Kieswetter in England's 30-man provisional squad for next year's World Cup. The uncapped Billings, 23, made his county debut in 2011 and averages 44.71 with the bat in List A matches. Kieswetter has suffered a setback in his recovery from an eye injury and is due to miss the 2015 season. He tweeted his congratulations to Billings, calling him a "seriously talented player" and "future star". The World Cup will be held in Australia and New Zealand from 14 February to 29 March 2015, with England's first match, against Australia, in Melbourne on 14 February. England's provisional squad includes two other wicketkeepers, Jos Buttler and Jonny Bairstow. All squads must be reduced to 15 by 7 January.